Reser djupt in i Mekong Delta på en hel dagstur från Ho Chi Minh City och utforska landsbygdens byar, flodöar och frodiga, krukväxta kanaler. Du reser med buss, flodbåt och roddbåt, stoppar längs vägen för att smaka på lokala livsmedel och lyssna på traditionell sydviennisk musik. Denna Mekong Delta-turné omfattar alla aktiviteter, lunch och rundturstransporter från utvalda hotell i Ho Chi Minh-staden. Möt en förare på ditt hotell i distrikt 1 i Ho Chi Minh-staden, följ sedan en klimatstyrd buss för 44-mils (71 km) resan till My Tho, en blomstrande marknadsstad på Tien Giang-floden. Fortsätt din resa till Mekong Delta på en motoriserad flodbåt, navigera över flodbyar och bondgårdar på väg till Unicorn Island, där du får se en fiskares hamn som bristlar med stilthus. Pausa för ett mellanmål av färska frukter och lokalt tillagade godisar, fortsätt sedan till Turtle Island, en liten flod öl täckt av fruktträd och frodig vegetation. Därifrån övergår du till en traditionell båt som är idealisk för att navigera i smala kanaler och utforska Mekongdeltillets tystare sida. Ditt nästa stopp är på en lokal biprodukt där du kommer att bryta för te sötad med lokal honung och lyssna på traditionell musik som bara finns i södra delen av Vietnam. Besök en närliggande kokosnötsby för att se hur kokosnötter förvandlas till hantverk och kokosnötsaker och börja sedan returresa med båt till My Tho. Denna full-dags Mekong Delta-resa avslutas med transfer tillbaka till Ho Chi Minh-staden och avstängning på ditt hotell. Excellent value for money. Some fascinating sights. Loved the sampan trip, wish it was longer. Lunch was very good too. A few opportunities to buy souvenirs but no sense of them being forced on you! Would go again!! We had a fantastic guide who spoke very good english, shared a lot of information about Vietnam and the Mekong River area. Comfortable bus ride to and from the Mekong. Viewing one of the Pagoda's was amazing and great architecture and statues followed by a Sampan ride along the Mekong to visit a candy factory and it was wonderful to see how life is lived along the river from using every bit of coconuts so there are no wastage. So much to eat with the fresh fruit and then time for a canoe boat ride which was very crowded and hectic but lots of fun!! Lunch at TINY GARDEN HOMESTAY with lots of fresh local produce and our group was so full we couldn't eat anything more!!! Fantastic tour operator and definitely worth another visit when we go back! Miss Nhi was a great guide. I liked that we could see how the local people work in their little factories making local products and we could buy them in a very good prices. Everything was nicely organised! This tour was not what I was expecting. The part where we take a river boat down, what I'm guessing was the Mekong Delta, only lasted for about 5 minutes. So I was rather disappointed that we didn't do more than just take a boat from one end of the river to the other. The bike ride also lasted about 5-10 minutes and we just went from the road to the homestay for lunch, so we really just rode down a small sidewalk that went around people's houses. I do have to say that as a vegetarian, the people there were extremely accommodating and made me tofu and some traditional side dishes, as well. In addition, the Bee farm wasn't really a farm. It was a cafe where they let you sample the honey with a special tea and then they brought out a box of bees. The Coconut Factory was interesting to see, that part I did enjoy! 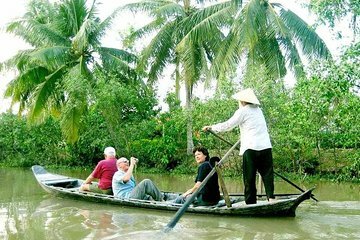 All in all, when the tour was done, the other people I met on the tour and I were wondering what exactly we accomplished in that day, as we weren't sure we went down the Mekong Delta. Our trip to the Mekong River was wonderful......the tour guide was excellent. Though the van that brought us to the river was quite cramped beside that the whole trip was great. We really enjoyed!!! Pickup on time, the guide was very informative. 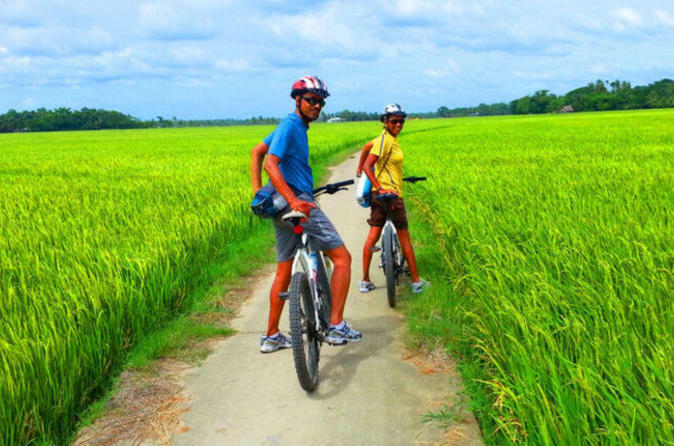 Minh has given us a lot of useful information about the Mekong Delta. The bus is very comfortable and this group is so funny. Totally happy with this service. was a bit crowded with a lot of tours doing the same thing. This trip was also very nice for me to experience the Ho Chi Min trip. Especially, if by the public traffic transportation, I might be much harder to have a trip within Mekong city because Mekong city is very far from Ho Chi Min general city towns. As the hotel pick up service is also included, I didn't need to be anxiety of the times to move and for traffic. And also I could have some quite unique and special experiences which I couldn't do easily at the other places.. The paid money also wasn't wasted at all. I didn't regret paying the cost for this trip although a little expensive. I want to recommend everyone to plan this trip itinerary if you travel abroad to Ho Chi Min city.